← Happy Engrish Friday! Freedom! Do you remember Pee Wee Herman’s Playhouse, and how it always seemed delightfully trippy, in a way that you didn’t quite understand? Even if you may not have understood the very meaning of the word trippy? Well, here is something that makes Pee Wee’s Playhouse look like Little House on the Prairie for all it’s boring mundanity. 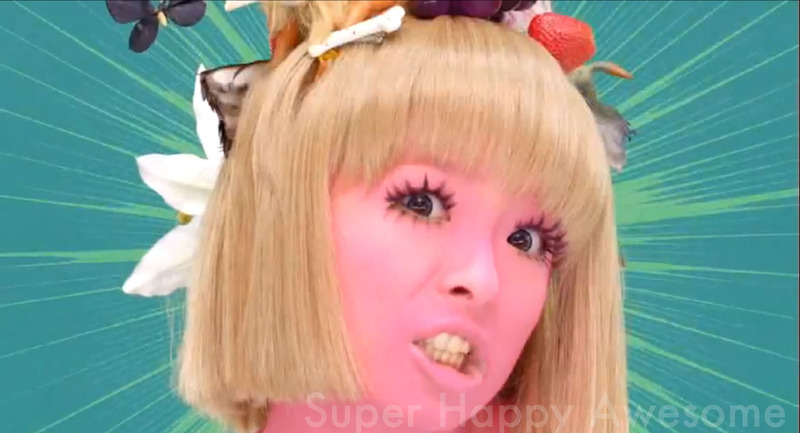 Ponponpon is the very first music video from Harajuku fashion blogger Kyary Pamyu Pamyu, of the hengao (strange face) and her very own line of false eyelashes. The song is surprisingly catchy, and the video delightfully surreal. With her own debut mini-album “Moshi Moshi Harajuku” due out on August 17th, you can enjoy this ridiculously ridiculous video from Harajuku-girl turned fashion maven turned pop-star until then! Colorful, surreal, insane, ridiculous–this is the perfect example of what Harajuku is, or wants to be. And if it gets stuck in your head, well…don’t say we didn’t warn you! This entry was posted in Video and tagged carrie, fashion, Harajuku, kyari, kyary, music, music video, ponponpon. Bookmark the permalink. Right?? I love how the brain is SO WEIRD and yet not the weirdest thing in this video! All I know is I saw some Lisa Frank stuff in the beginning and it made me happy. And that creepy no-face background dancer is weird. Hehe, I love the creepy no-face background dancer! Super weird though, agreed. Also, I was wondering if that was Lisa Frank stuff! It has a face. It’s just a raspberry. Tanks! That was pretty wild. I’ve never dropped acid and thanks to this video, I don’t need to. Thanks, Alice! Haha, glad I could be of service! The box of Kraft Mac and Cheese just ties the whole thing together. It may be one of my favorite parts! Where can I find the lyrics in english? So wonderfully, delightfully weird and trippy, this video makes my brain dance! Kyary is my new drug of choice. I love how, just as soon as I think I’ve seen it all, Japan always has more amazing/hilarious/random/strange things to show me.